Britax Römer DUALFIX i-SIZE Review: I have some exciting news! We have been asked to be Britax Römer Brand Ambassadors. This is something I am really excited about as it is a brand we have used a lot since having the boys. 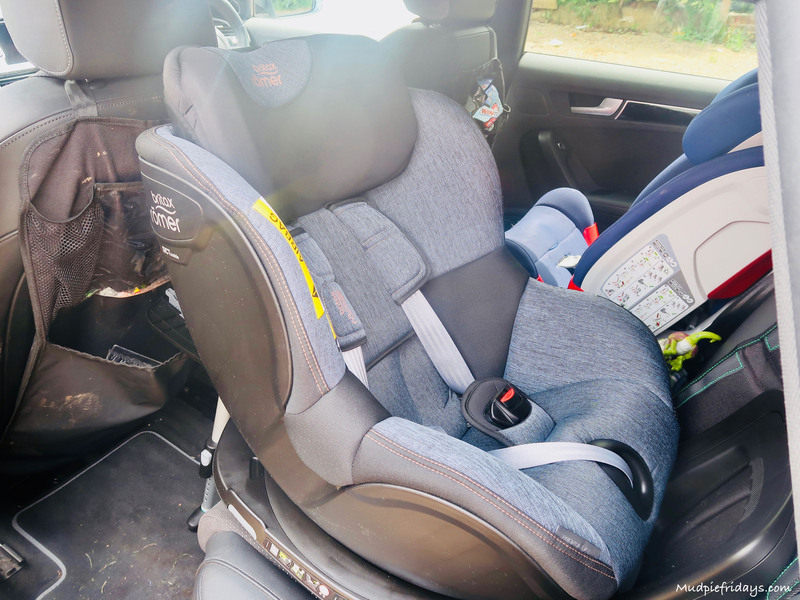 Both boys have had Britax Römer seats for a number of years. Our first task as Ambassadors was to test out the new Britax Römer DUALFIX i-SIZE. I was interested to see how the new version was different to our already existing Britax Römer DUALFIX. Heres how we got on. 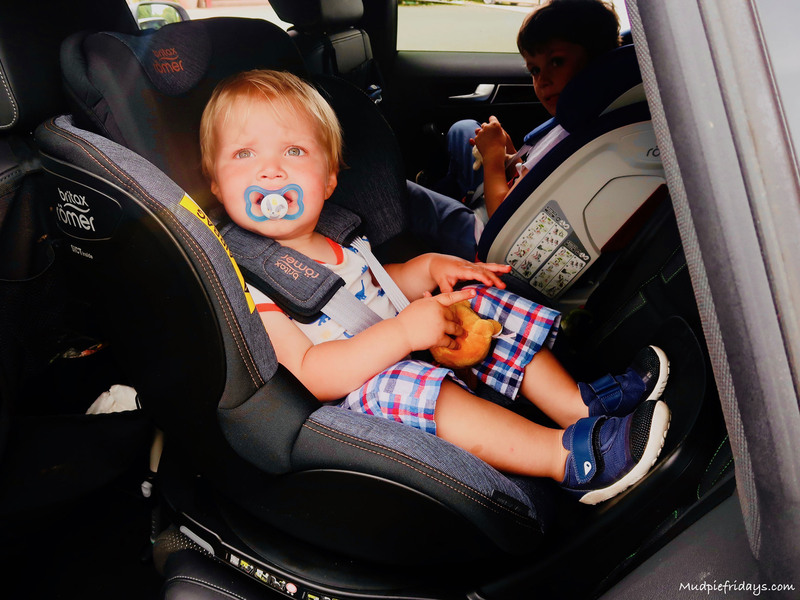 Choosing a carseat for your child is a decision we agonised over espically as first time parents. I soon learnt a whole barage of different acronyms and options. i-Size being one of them. 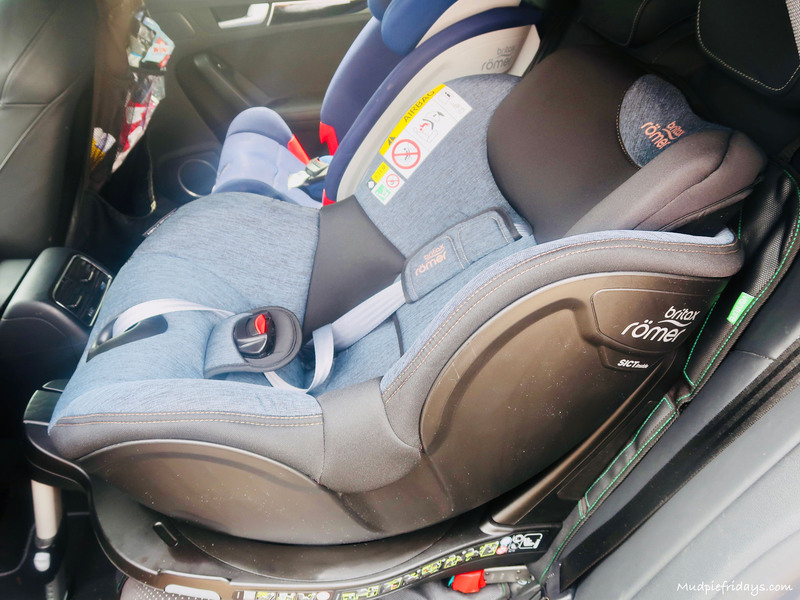 i-Size is a new European regulation which came in 2013, it basically means that these seats meet new safety criteria which is designed to be better for your child. Such as a five point harness, more protection around the head and neck area and better impact protection overall. One of the other key pieces of legislation is that you need to keep children rear facing until fifteen months. We had Monkey in 2012 when this legislation wasn’t in place. However we chose to keep him rear facing for as long as possible in fact we didn’t turn him round until he was about two and half. We only made this decision because his legs were really getting too long and it was becoming uncomfortable for him. This is something which we intend on doing with Kipper which is why I love this seat so much. Because as they get older it can become more difficult to put them in a rear facing seat. But with the Britax Romer DualFix i-Size you don’t need to worry because it rotates 360 degrees. Which means he can stay there until hes around 105cm tall. Designed from 0-4 years (40cm – 105cm) – although his is stationary carseat and does not have a clip off infant carrier. Not that this is an issue for us as Kipper has just turned two. 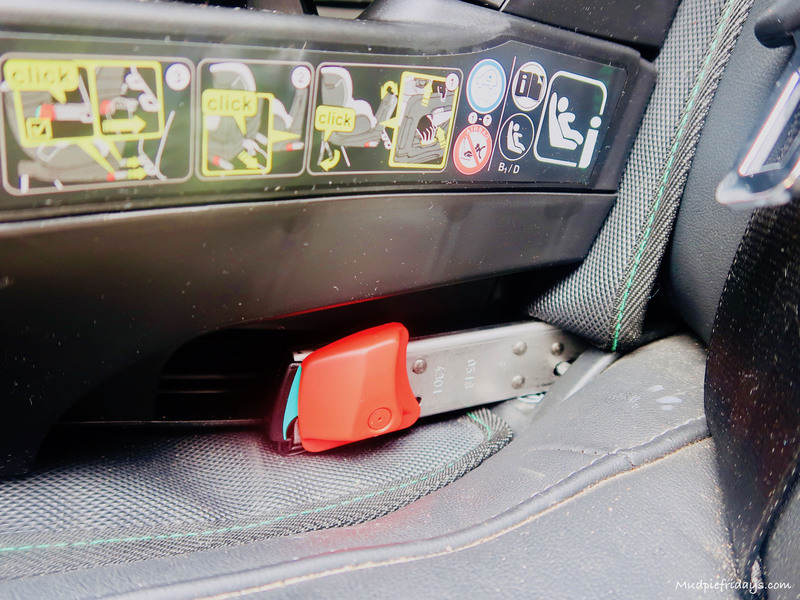 It is secured into your car with Isofix. I really wouldn’t now seriously consider a seat that doesn’t have Isofix. 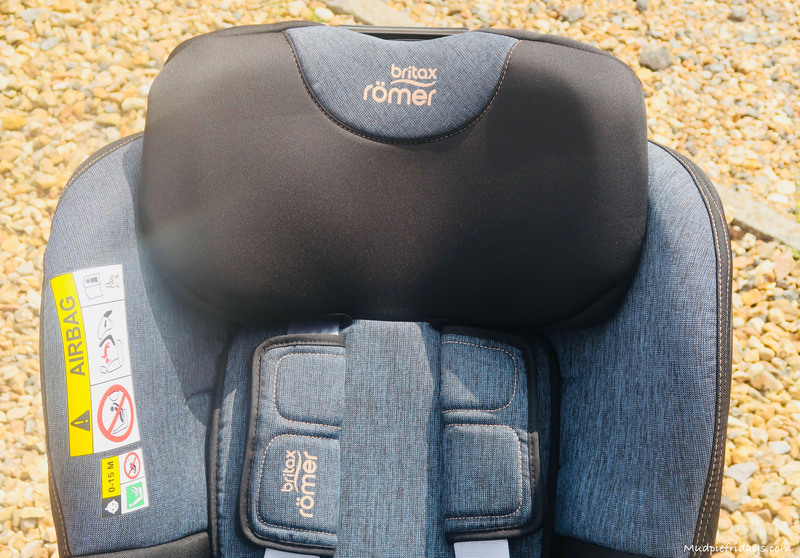 We feel so strongly about this that Monkey at six and in an Isofix seat another Britax, the Britax Romer AdvansaFix. It rotates 360 degrees which means you turn the seat to put Kipper in and then turn it back again. Simply operated by pushing a button on the side. 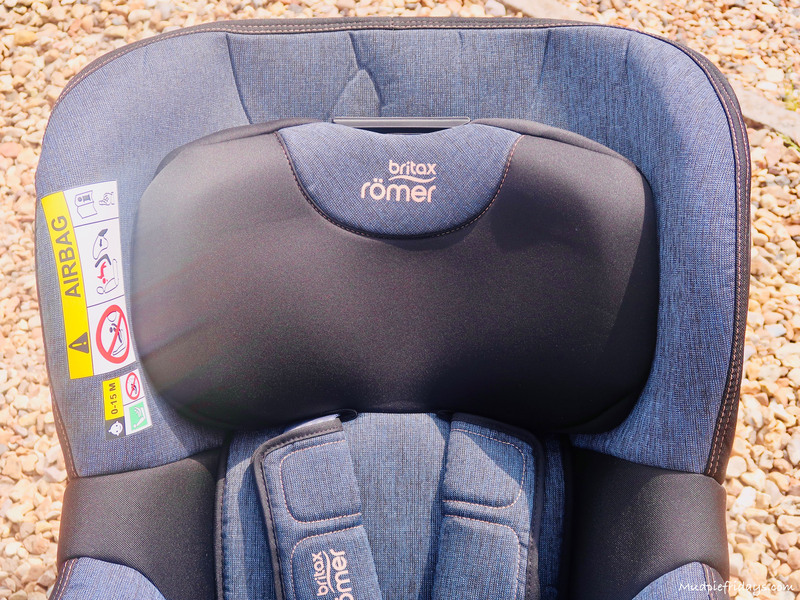 Britax Römer’s patented pivot link system greatly reduces the risk of head and neck injury by redirecting the force of impact downwards into the seat. 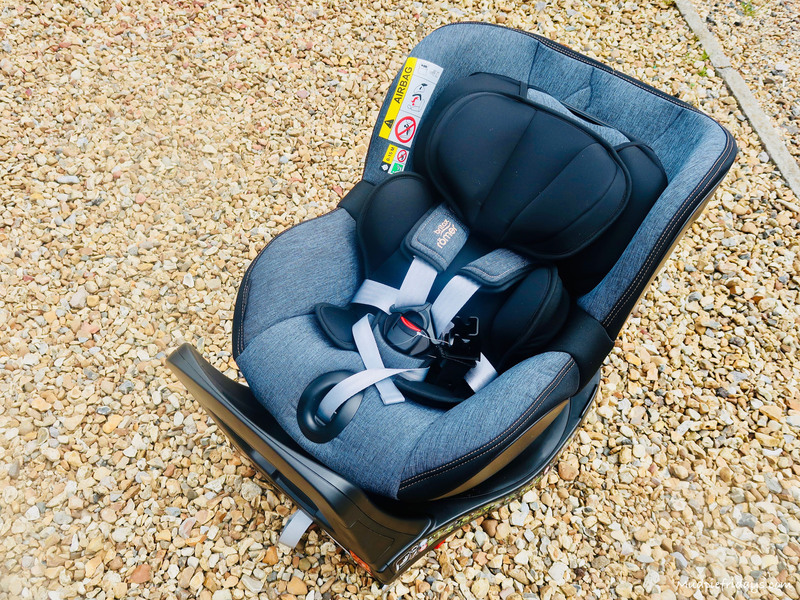 The adjustable support leg gives this seat extra stability, minimising tilting and reducing forward movement forces exerted on your child if you are involved in an incident. 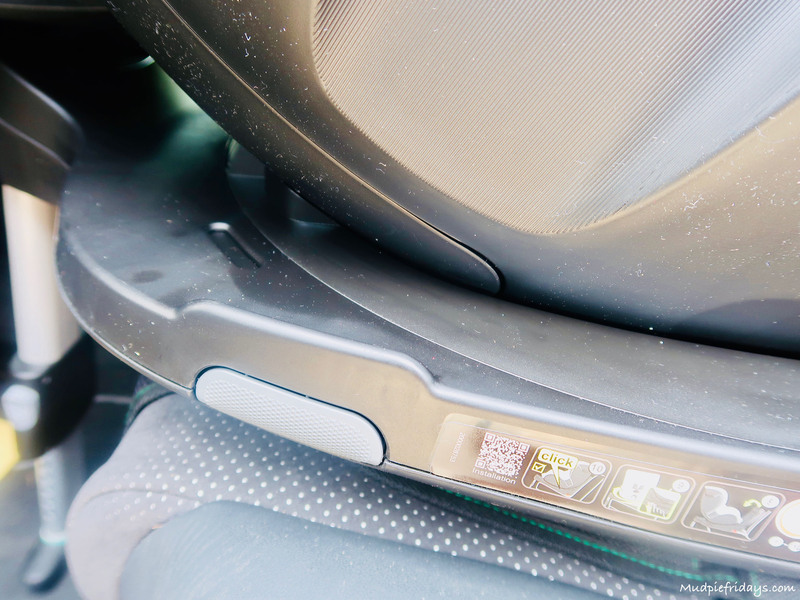 The DualFix i-SIZE headrest is v-shaped to ensure optimal protection in the event of a side collision and, along with the harness, can be adjusted from the front of the seat to adapt to Kipper’s height. This is simply done by a button on the head rest. There are four recline positions in the seat to cater for your growing child. My husband made short work of the installation, simply attaching the isolfix and then adjusting the height adjustable leg. He also adjusted the back plate – the rebound bar. This is designed to help the car seat to stay upright on impact. The whole process took a couple of minutes at the most. Kipper has been very happy in the seat often falling asleep, he also enjoys climbing into the seat himself. 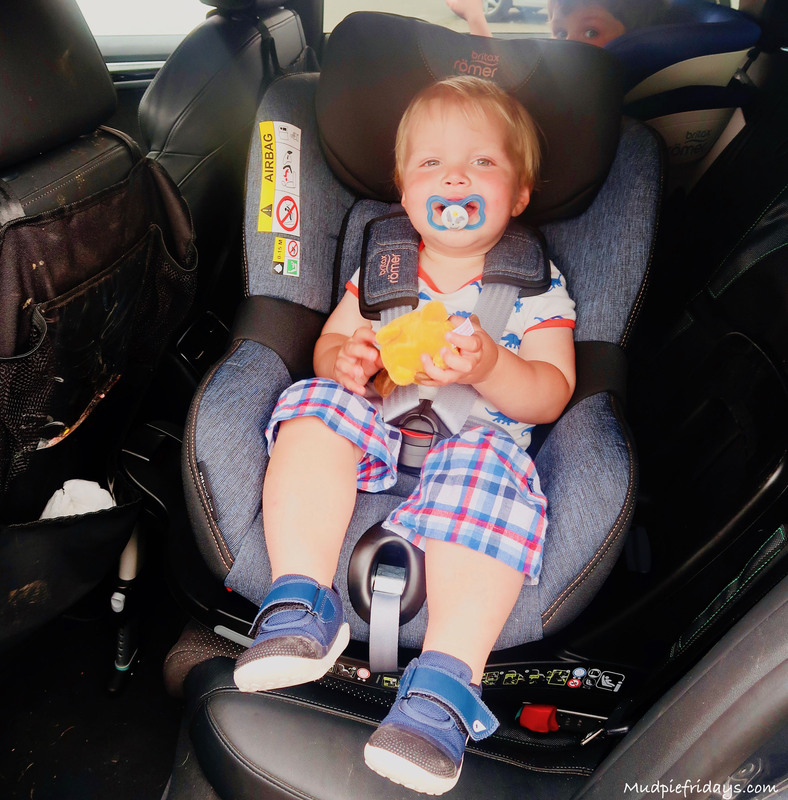 He cant seem to get his arms out of the five point harness in this seat unlike others we have trialed. The is an ascetically pleasing seat which comes complete and requires no fiddly assembly. The isofix base is reassuringly solid. The 360 degree turn means that Kipper can now climb into the seat himself. We have an older model of the Britax Römer DUALFIX i-SIZE and I like that the button has now been moved to the side it makes it more intuitive and if possible easier to use. Not only this but you can rotate it in any recline position. Plus its possible to use all the recline positions either forward or rear facing. Which is good as Kipper’s head still has a tendency to fall forwards when the seat is upright. The installation process is so quick and easy I can not stress this enough! Although we are use to Britax seats and this model, its possible to move it in and out in a few minutes. The extra bulk in this seat compared to to previous model is substantial which I am guessing is because of the I-Size compatibility. It definitely makes me feel more content that Kipper is as protected as he can be should we have an accident. There is a link on the website which allows you to see if it will fit in your model of car, plus a youtube video on installation. Our seat is in Blue Marble which looks a bit like blue denim. Along with this there are nine different colours to choose from. Price wise it retails at £430 which is on the higher end of the price scale. However I think its well worth the extra and we are considering upgrading our old Britax Romer DualFix (which lives in my car) to the i-Size model since testing this one. Coupled with the fact that you do not have to buy another seat at 15 months when baby grows out of Group 0, I think its extremely good value for money. In Summary we love this seat and would recommend to others on the basis of our experience. We received our Britax Römer DUALFIX i-SIZE for the purpose of this review all words and opinions are my own. Looks a great car seat! Love the style and size! This is the car seat I’m looking to get my daughter. I love Britax car seats! 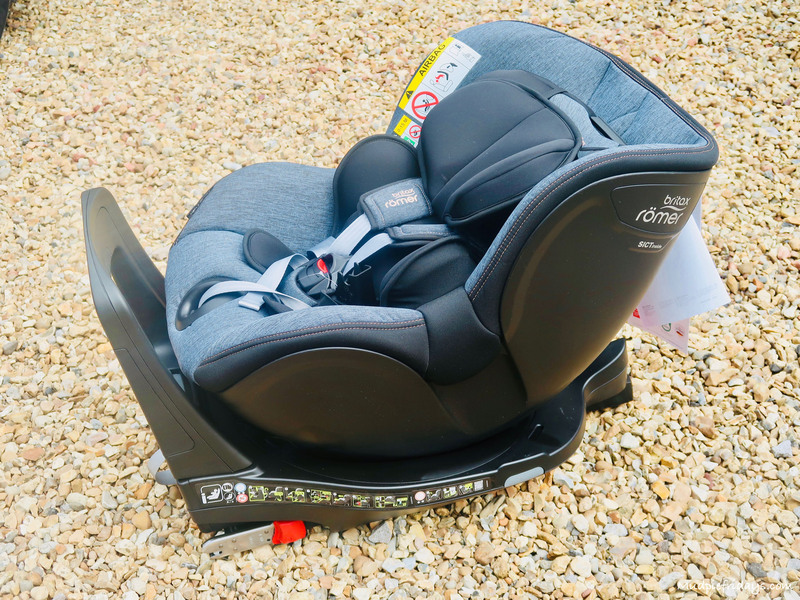 This looks a really safe and adaptable 0-4 years (40cm – 105cm) car seat so I’ve forwarded the blog link to my daughter who is trying to decide which car seat to buy for her first baby, due in early September! Looks very comfy and secure. It looks like a super comfy car seat and I love the 360 rotation feature I bet that comes in super handy! Great review. Choosing car seats is so confusing so I found this very informative, thank you! 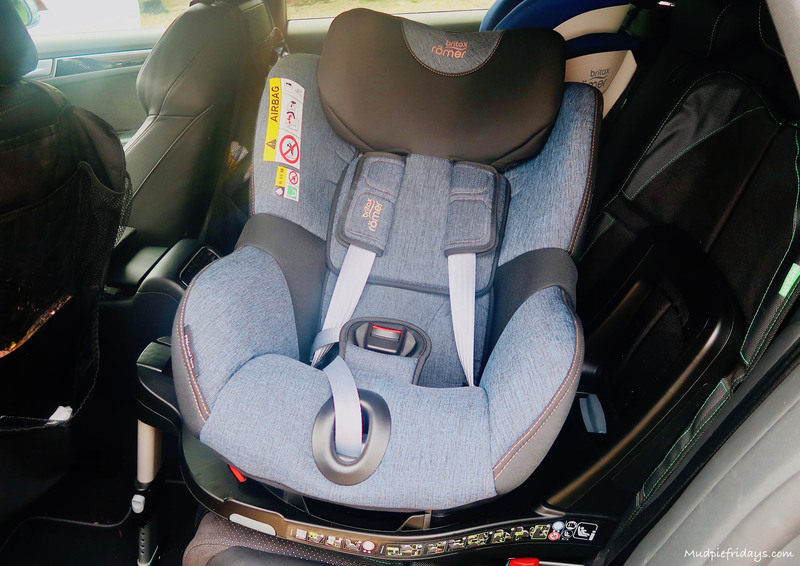 I love the rotation feature and the look of this car seat I am looking at buying my youngest a new car seat and will keep this one in mind when it comes to buying it. Brutal are good ! That’s a really strong and comfy looking one . Like the colour too. Sorry computer should have said britax not brutal ! That looks excellent; so comfortable and secure. Thanks for the review.